Rename SplashScreen.bik, MGSLogo.bik, TheCoalitionLogo.bik, and UE3AnimatedLogo.bik. Undo this change before downloading any update for the game otherwise Microsoft Store may download the entire game again. Can be selected even if you don't have a 4K monitor to induce downsampling. Fullscreen is always borderless (no exclusive fullscreen). In-game setting added in Title Update 5. In-game setting added in Title Update 5 (also requires Windows 10 Update KB 3156421). Enabling vsync may cause stuttering even if the system can otherwise run the game well. Delete cannot be bound to commands as it is used to delete bindings. Support for multiple GPUs is being worked on. This error occurs on laptops with switchable graphics. The current solution is to change the primary GPU global setting. Choose Preferences, then choose Radeon Additional Settings. 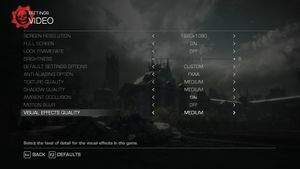 Under the Power section, choose Switchable Graphics Global Settings. Set the appropriate power mode to Maximize performance. Set Preferred graphics processor to High-Performance NVIDIA processor. ↑ Vsync creating a stuttering issue. 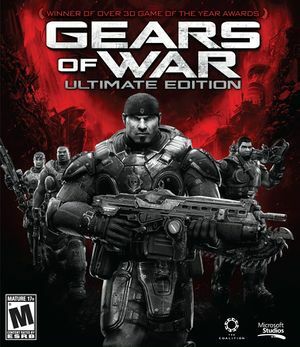 ↑ Rod Fergusson on Twitter: "@SPARTAN_132 @GearsofWar @Microsoft working on multi-GPU and if you unlock framerate it runs at monitor framerate so may need to bump it up." This page was last edited on 8 November 2018, at 04:42.